When first hearing about this book, I wondered what a dip was. Godin says, whenever you start working on something new, you go through different phases: At first everything goes smooth because you're learning fast and it's fun. After a while, the dip comes. This is a phase where you hardly make any progress, and most people quit. If you think the only way to handle a dip is to persevere, you're wrong. Godin's point is, that despite having been conditioned to consider quitting a bad thing to do, it is an essential behaviour if you want to be successful. During a dip, you only have two options: conquering or quitting. There is nothing in between, if you think it's worth it, find a way through, if not, just quit. According to Godin, everything in between is a waste of time. Although we might think of a dip as an unpleasant thing, it is something that helps us to be successful: If things were easy, everybody could do it. Making it through a dip puts you ahead of competition. We should embrace the dip and welcome the challenge, while keeping in mind why it's worth going through the dip. Another point Godin makes is this: You should strive to be the best in the world at what you do (world is a flexible term, it could also mean being the best barber in your street). It's like the other end of the long tail: it's the short head. When you are in the short head, you will be rewarded beyond all proportions, as our society adores the best. In order to become best in the world, you need to choose your dips carefully, and find the right mixture of persevering and quitting. Most people persevere when it's easy, and quit when it gets hard, but Godin tells us that it might be worth quitting although things are easy, or it might pay off to conquer a dip although it is hard. 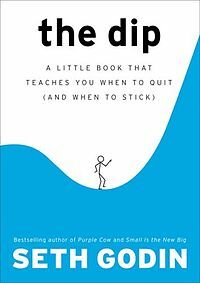 While I find the metaphor of the dip quite intriguing, I wished Godin had showed some recipes how to find out if a dip was worth conquering or not, or even techniques on how to make it through a dip. But as another reviewer said, "Seth Godin doesnt claim to have all the answers. But he will teach you how to ask the right questions", at which he succeeds.